Are My Property Taxes Due? Taxes, as well as buying and selling real estate, can be very overwhelming. Real Estate Property Taxes are included in every Escrow transaction and can be confusing because it’s always paid and prorated differently depending on the time of year. 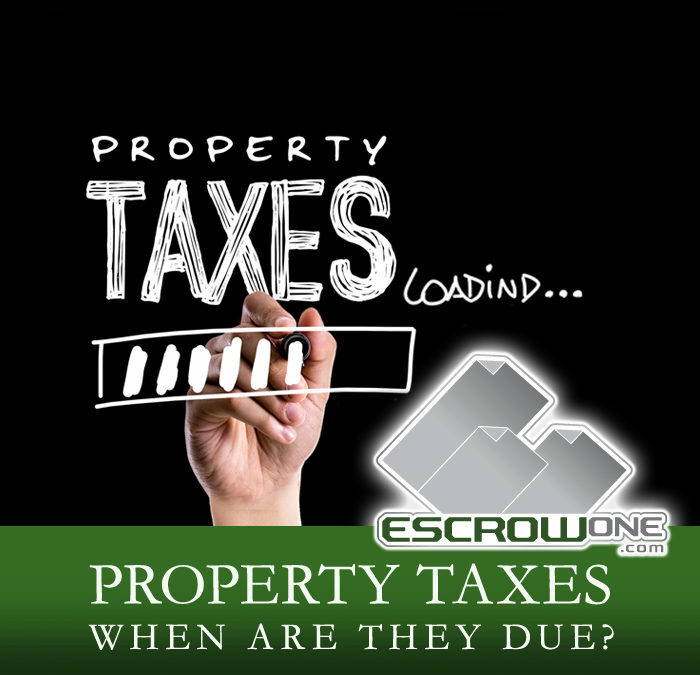 EscrowOne, Inc. will make every effort to give you an understanding of the Property Tax due dates, delinquent dates as well as the prorations credited through Escrow. While in Escrow, Taxes are usually paid current and then prorated so the seller and buyer are only paying property tax for the time-period they own the property. The Buyer’s new lender is usually the one who will determine if taxes must be paid through the file, or if they will collect enough at the closing, to pay themselves, when they are due. Below is a tax proration chart to help you determine what may be required of you during your upcoming transaction. Jan. 1st through Jan. 31st Prorate from Jan. 1st to the Close of Escrow debiting the seller and crediting the buyer. Feb. 1st through April 9th The seller would pay the 2nd Installment. You would Prorate from the Close of Escrow to July 1st, debiting the buyer and crediting the seller. April 10th through June 30th Seller would pay 2nd Installment and any delinquencies (if due) and you would prorate from the Close of Escrow to July 1st, debiting the buyer and crediting the seller. July 1st through Oct. 31st Prorate from July 1st to the Close of Escrow debiting the seller and crediting the buyer. Nov. 1st through Dec. 9th Pay the 1st Installment of the new Fiscal Tax Year. Prorate from the Close of Escrow to Jan 1st debiting the buyer and crediting the seller. The Seller would pay any delinquent penalties and assessments. Dec. 10 th through Dec. 31st Prorate from the Close of Escrow to Jan. 1st debiting the buyer and crediting the seller. Keep in mind that even though not yet due, the new lender can require that the next installment of taxes be paid. If that occurs, the prorations would be adjusted to reflect the new paid to date. EscrowOne is always happy to answer any questions and explain your transaction to your full contentment, providing you with confidence that you made the right choice with EscrowOne, Inc.